Polish DEUS MORTEM bases their music on the emotional essence of the genre. The band was established by Necrosodom (ANIMA DAMNATA), was later joined by Inferno (BEHEMOTH) and started to gather attention with their album “Emanations of the Black Light” (2013). 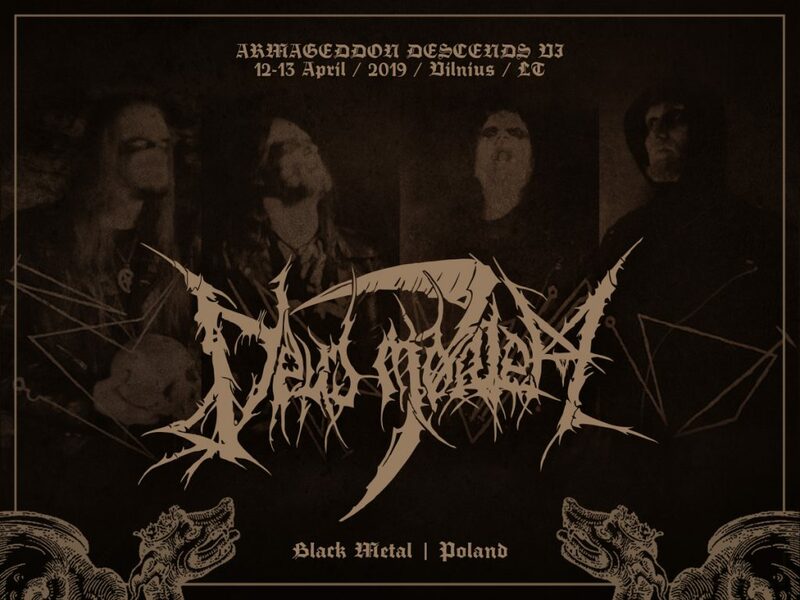 The album presents a convincing interpretation of the second wave of black metal, creativity of which is rather stripped and basic, but definitely not monotonous or primitive. DEUS MORTEM has gathered a lot of touring experience, is well known for their fierce and ripping live performances, and is highly wanted in various metal festivals. Recently they have completed a new album, and, before embarking on a European tour together with MGŁA and REVENGE, will present themselves in Vilnius. ATTENTION: DEUS MORTEM replaces DOOMBRINGER, who, due to the unforeseen circumstances, would not be able to come. We are sorry for the fans of the band.